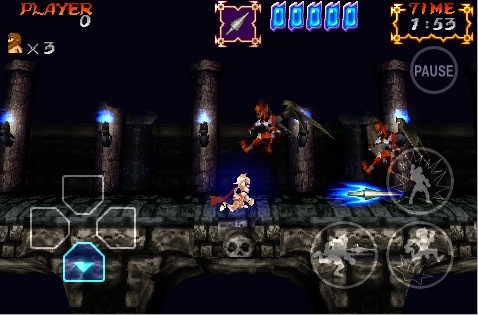 Capcom's classic series comes to iPhone. When a classic game is re-released on the iPhone and iPod Touch, we usually find ourselves dreading its arrival. That's because, for the most part, old-school games haven't received much love on the mobile platform. Mega Man 2 is a disaster beyond words, Sonic the Hedgehog comes up short compared to the 16-bit original and both Streets of Rage and Golden Axe are tedious brawlers with no multiplayer support. So when we heard that Capcom released a new Ghosts'N Goblins game, we cringed at the thought of frustrating gameplay and presentation issues. But you know what? Capcom surprised us. Not only is Ghosts'N Goblins: Gold Knights playable, but also lots of fun. 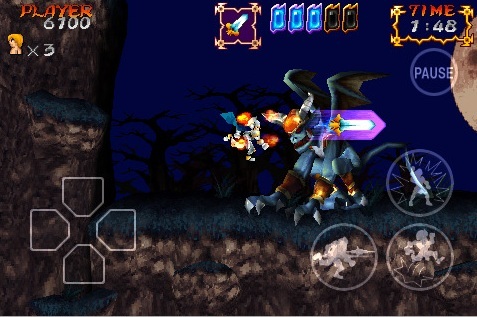 The game utilizes a touch-screen set-up that's similar to other classic games, using an on-screen digital pad for movement and buttons to jump, attack and use magic spells. However, Capcom mercifully slowed things down, allowing you to get used to the controls without being overwhelmed by a screen full of undead enemies. As a result, you'll find yourself having a good time, without feeling the need to lob your iPhone or iPod Touch across the room. Aside from surprisingly good gameplay, Gold Knights also has a sharp presentation, almost on par with the previously released Ultimate Ghosts'N Goblins for PSP. The visuals look delightful, striking a resemblance familiar to older Ghosts games, while using some fancy 3-D animation tricks to make it look contemporary. The animations are great, and the weapon effects scatter across the screen like fireworks displays. The downside? All of this stuff bogs down the game's performance, causing it to chug along from time to time. The music is equally impressive, featuring a variety of both old favorites and a couple of new songs; we suggest using headphones. The sound effects aren't much, but on the bright side, at least Capcom decided against giving Arthur and Lancelot annoying voices. As a side note, and for an additional dollar, you'll unlock unlimited lives, the Gold Armor and other goodies. Yes, you can buy your way to victory. It's a cheat, but an optional one. Still, there could've been a better way to earn these rewards, rather than let your money do all the work. At the moment, Ghosts'N Goblins: Gold Knights sells for $2.99, and that's a reasonable bargain considering it's Capcom's best iPhone/iPod Touch game to date. What could've been just another poor playing classic is instead a fun side-scrolling romp. What's Hot: On-screen digital pad and buttons actually work (for a change), terrific graphics and audio, the ability to play as a secondary character is a nice touch, good pacing makes the game feel more balanced than previous Ghosts games. What's Not: Excessive slowdown, cheaters can buy all the powerful stuff for a dollar.